Here's something you aren't used to from me, a purely personal post without any additional commentary. I've already written one essay where I mentioned this news, but this is more out in the open. On approximately September 30 of this year, my partner Genevieve will be giving birth to our first child. A week ago we found out that our child will be a boy, and all signs so far point to him being healthy. We are both very excited about this and have been doing everything we can to prepare for this momentous occasion. Please keep us in your thoughts. This is quite a time for us! 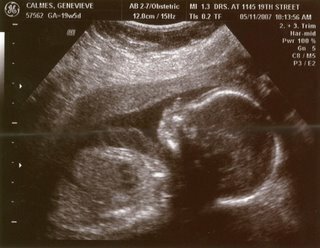 I thought you might like to see an ultrasound picture; here he is at 20 weeks. I have another picture on my door where you can see a little hand and a little foot. We like this picture, though, because he looks like he'll have big lips like me! Dan was a beautiful soul. I doubt I have ever met a more pleasant person, and I have met many pleasant people in my life. I just felt helpless, though, trying to convey how much I loved Yellowstone, and I felt small because in my heart I knew he must love it more. 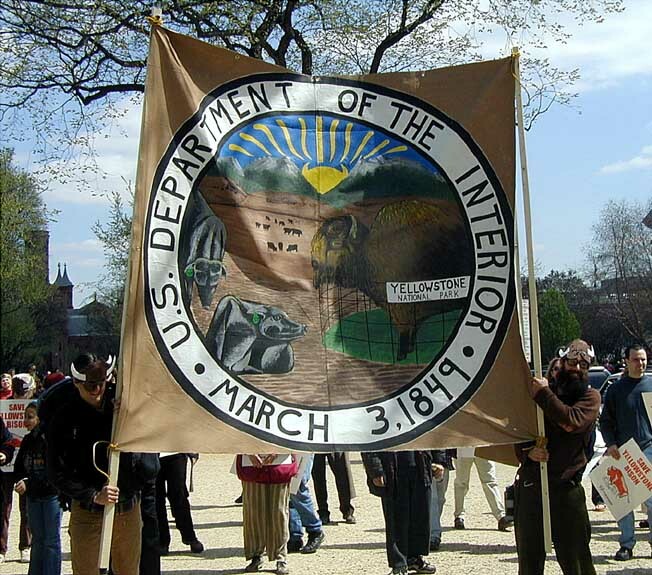 On May 9, 2007, Dan Brister--who is the man on the left holding the banner during the April 2002 march--was injured and arrested while videotaping hazing operations perpetrated against Yellowstone's bison like he has for so many years. I lost touch with Dan as priorities changed and life imploded around me, but I have never forgotten him. It makes me sad that he has gone through this and yet happy that he remains defiant and vigilant working on behalf of those who are victims of politics and economics based on a misplaced sense of entitlement. I have witnessed and encountered many similar situations with law enforcement over the years. My firsthand encounters are so palpably similar to what has been described by Buffalo Field Campaign in their press releases that I must admit that I cannot imagine another side to this story, not after having met Dan, not after having seen police in action in situation after situation. I suspect that some of you reading this will be quick to jump to a different opinion, though you have not seen firsthand the kind of things police routinely do to anyone who has the nerve to stand up against their crimes. There are several accounts on this blog alone that tell you what we deal with here, in public, with a police force trained to deal with activists. I'm sickened, even though I have grown to expect it to happen. It hits a raw nerve in me. The least I can do is raise up Dan Brister and point people to what's going on not only in the case of he and his friends but with the bison of Yellowstone. and further updates as they appear in the Yellowstone Newspaper.